I’m going to select a team of the weekend but it’s going to be selected as to be tactically viable so there’s not 6 strikers or anything like that. Krul has been missing with an injury over recent weeks and his return was absolutely critical to Newcastle’s win. He produced a truly breath taking save from a Dimitar Berbatov header which kept Newcastle nerves under control during a period of increased frustration due to being unable to make the break through. His presence as an organiser behind the back four made a noticeable difference. He scored potentially the most important goal of the season so far, from right back, and it just so happened to be a spectacular volley. His goal swung the tide back towards Villa who were under enormous pressure from a Stoke surge. He made it 2-1 to Villa when it looked to be heading the other way. Villa flooded with confidence and dominated the game thereafter. Collins was the key man in West Ham holding on to a key point at Anfield. Even though Liverpool should have won the game easily, and if they had he probably wouldn’t have been on this team, he still did his part. He made critical interceptions and last ditch blocks and eased his new partner Tomkins in to the game. Collins is prone to a mistake but he kept his slate clean this time. This was the game that Yanga-Mbiwa announced himself on to the Premier League stage. He brought his all action rugged style that made him one of the leading defenders in France in a Championship winning Montpellier side last season. He got in the way of everything that Fulham threw at Newcastle and was the cornerstone of an incredibly important clean sheet for Newcastle. Two words: rock solid. 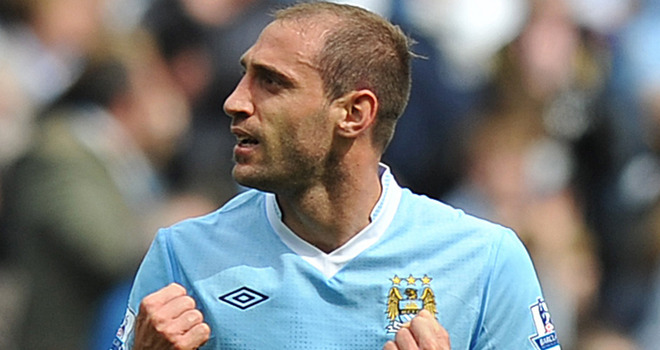 Zabaleta was back to his early season form that has shown him to be the very best full back in the world. Man United got absolutely nothing down his side of the field. He and Milner completely shut it down. A superb performance. Milner rightly won the man of the match award for yesterday’s Manchester derby. Performances like this show Milner at his very best, covering the field, making a nuisance of himself, distributing the ball solidly and shielding Zabaleta thoroughly. Perhaps his best game of the season. 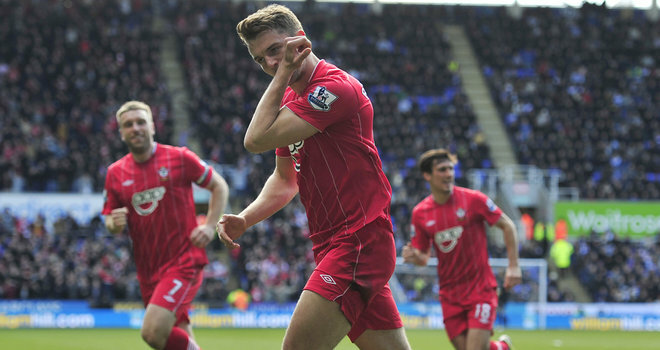 The importance of Cork was shown as soon as he stepped back in to the Southampton team. Against Reading he was at his elegant gliding best. He was tidy and comfortable on the ball and showed off his range of passing. Defensively he was all over the pitch making tackles and interceptions. Rosicky has been so troubled by injuries at Arsenal that it is easy to forget what a good player Arsenal signed when they first bought him from Dortmund. Against West Brom he flashed the talent that he has done every so often. Frustratingly infrequently for Arsenal fans though. He scored two excellent goals and showed authority and control of the ball in midfield. Rodriguez is the Player of the Weekend. He put in the most dominant display of any player. He scored against Reading with a good poachers effort, hit the bar and had another well saved. Every time he got the ball he was direct and his pace absolutely terrified the Reading defence. Since the arrival of Pochettino he has been one of the league’s form players. It’ll be interesting to see what he is capable of next year because his combination of pace and skill is something you don’t find every day. Agbonlahor showed that pace can win game against turgidly slow teams like Stoke. He was a threat all game as part of Villa’s rapid and troublesome front 3 which Stoke could not handle. It’s games like this that remind you how good he can be. If only he could string a row of these together. Mirallas is quietly playing some of the best football in the league right now. He has really come in to his own on the right of the Everton attack lately and it is no coincidence that his form has come at the same time as Everton’s return to form. He scored a sublime goal against Spurs on Sunday. After a mazy high speed dribble through the Spurs defence he drilled the ball in to the far corner. He was also a constant thorn in the side of Spurs all game. Bang in form. Posted on April 9, 2013, in Fantasy XIs, Feature Column, Views on the News and tagged aston villa, Everton, James Milner, Manchester City, Matt Lowton, Pablo Zabaleta, southampton, Spurs. Bookmark the permalink. Leave a comment.